CT scan (computer tomography) and PET scan (positron emission tomography) are different but related imaging techniques. A PET scan uses nuclear medicine imaging to produce a three-dimensional picture of functional processes in the body. PET scans provide metabolic information and are increasingly read alongside CT or MRI (magnetic resonance imaging) scans, which provide anatomic information. CT Scan costs range from $1,200 to $3,200; they usually cost less than MRIs (about half the price of MRI). 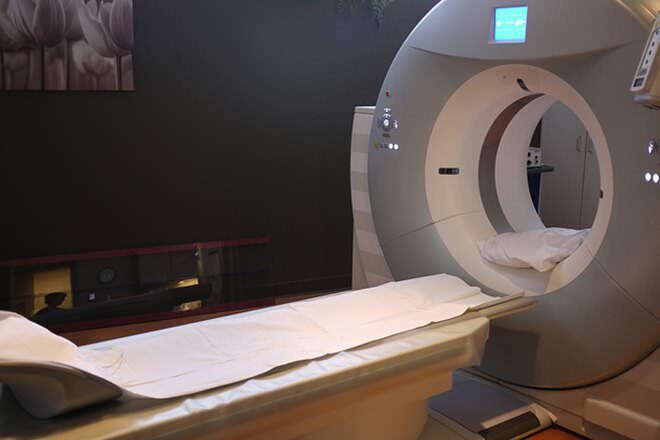 PET scans cost $3,000 to $6,000; much higher than regular CT scans. CT can outline bone inside the body very accurately. 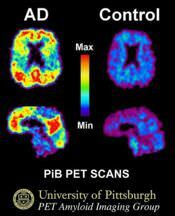 PET scans can image biological processes within the body. Uses X-rays for imaging Radioactive tracers that emit positrons are used. The positrons are tracked by the system to generate a 3D image over time. The first commercially viable CT scanner was invented by Sir Godfrey Hounsfield in Hayes, United Kingdom. First patient's brain-scan was done on 1 October 1971. The compound was first administered to two normal human volunteers by Abass Alavi in August 1976 at the University of Pennsylvania. PET Scan brain image of a patient with Alzheimer's disease (L). A CT scan provides good detail about bony structures and some detail of soft tissues. It answers the question ‘What does it look like?’. For example, an abnormal growth like a tumor can be easily detected using a CT scan. A PET scan on the other hand is more useful in providing a good detail of functioning of body parts. It answers the question ‘How is it working?’. For example, staging and monitoring treatment of cancers. CT Scanning is useful for screening diseases such as colon cancer, detecting injuries and abnormalities in the head, chest, heart, abdomen and extremities. This technique is often combined with other techniques such as MRI, and ultrasonography. 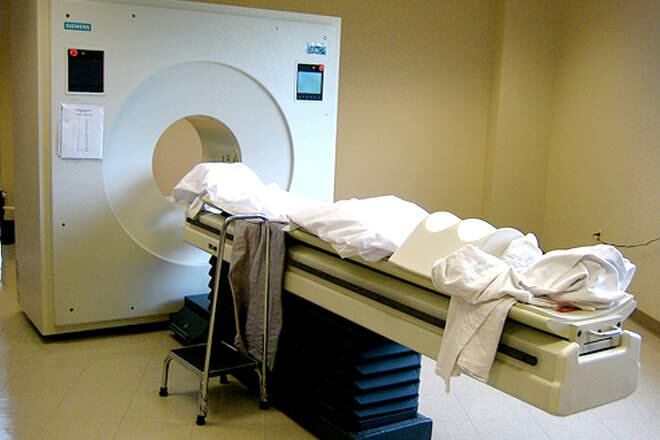 PET scanning is used effectively in oncology (study and treatment of cancer), neurology, cardiology, Cognitive neuroscience, Psychiatry, Pharmacology and Muscular-Skeletal Imaging. A CT scan relies on a series of X-rays and is usually completed within 5-10 minutes. On the other hand, a PET scan takes anywhere between 2 to 4 hours. The basic principle behind a CT scan relies on the reconstruction of a three dimensional image of an organ, by a computer. During a CT scan, the patient is moved along the scanning system, during which multiple X-ray images of the organ being examined are acquired from different angles. These images are obtained by passing multiple beams of X-rays through the region of interest. Sophisticated computer algorithms combine all these images to create a view of the organ, which is available soon after the scan is complete. During a PET scan, a radioactive substance like fluorine-18 (F-18), fluorodeoxyglucose (FDG) or oxygen-15 is injected into the patient’s body. This is called a tracer or radiotracer. Each tracer has the ability to get absorbed by the particular organ or tissue being studied. It takes 30 minutes to an hour for the tracers to get absorbed. Only then can the patient be moved into the PET scanner and imaging can start. The tracer is injected into the body on a biologically active molecule and emits pairs of gamma rays. The PET scan system detects these gamma rays and thereby determines the movement of the tracer in the body over time. This movement is then reconstructed via a CT scan. CT Scan costs range from $1,200 to $3,200 and the cost of PET scan depends on the area examined and usually ranges form $3,000 to $6,000. The cost might vary in different countries. CT scans have advantages in viewing anatomical structures. Due to the high contrast resolution of CT scanning, differences between the tissues are more apparent compared to other techniques. Further, imaging in CT scan removes the superimposition of structures other than the area of interest. The data from a single procedure can be viewed in different planes and thus increases diagnostic ability. This technique is also popular because it can be used to diagnose a number of conditions. This might eliminate the need for other diagnostic techniques such as colonoscopy. Moreover, a U.S. government-financed study showed that annual CT scans of heavy smokers reduce the risk that they will die from lung cancer by 20 percent. PET scans have an advantage over regular CT scans in determining the functioning of biological processes. In a PET scan the imaging technique gets down to the cellular level of the body, hence it can detect the early onset of disease like cancer, before they start showing up in CT scan. It is also very useful in finding out how effective the treatment is. CT scans are associated with the risk of causing cancers, such as lung cancer, colon cancer and leukemia. This is mainly due to the use of X-rays. There are other safety concerns associated with the use of contrast agents which are administered intravenously. However, these disadvantages can be reduced with the use of lower doses. There is exposure to ionization radiation in a PET scan. Pregnant or breastfeeding women should not get this scan done. Some mild allergic reaction may occur in some people because of the radioactive substance used. Sometimes abnormal blood sugar and insulin levels may result in an erroneous PET report. by useing pet scan with your c/t scan does the c/t scan use more raddiaton on the pationt? I've had chronic pain for 12 years in my eyes and in the back of my neck with no diagnosis. I recently read an article describing the type two trigeminal neuralgia the symptoms of which seem to match mine. I've had numerous MRIs and CT scans over the years but nothing showed any nerves being irritated by a blood vessel in the V one section of my Trigeminal nerves. Would a pet scan show whether a blood vessel is compressed against trigeminal nerve either at the base of my skull or somewhere else in the V one area? I'm going insane with the pain which is constant and need help. Anybody help? CANCER SOLUTION for all types is to change to fruit and veg diet. Drink 3 glasses of organic carrot juice daily. If cancer / tumors are really big, go to 5 glasses. Must be taken daily. Also 3 tablespoon of Pure organic coconut oil daily. So in simple words one glass of carrot juice and 1 tablespoon with each meal = breakfast, 12pm, and supper. Avoid process meat and other pre-packed food. Results will be seen with in 3 - 6 months time. Large tumors will shrink and small tumors will vanish completely. Before starting chemo and radiology make an appointment for the coming 6 months to check if you still have cancer. This will avoid you all bad rays and chemo poison. At least this is my experience. Good Luck!! !